Not much happening today. Just more LOL shopping and chores and working around the house. Something happened Sunday evening when we returned home that we forgot to tell you. We keep a hummingbird feeder out most months of the year. Of course, when we are on projects it gets empty. We just assumed the birds that don’t migrate north moved on and found someone else to feed them at those times. Apparently not. We had been home less than an hour when one pushy hummingbird flew up and hovered at the window and stared at us. Max stopped unloading and cleaned and refilled the feeder. 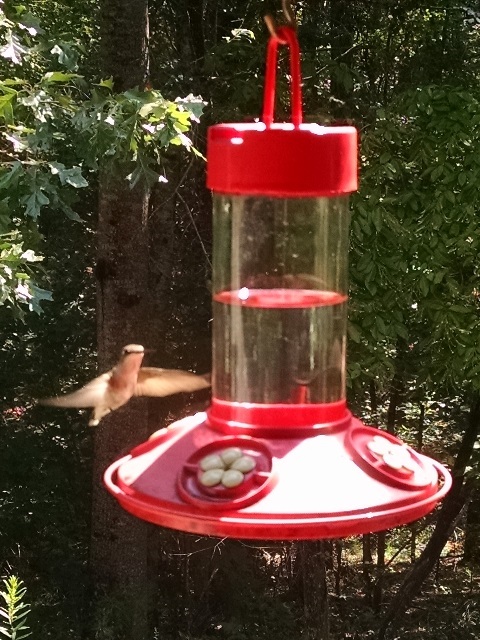 Within moments the hummingbird was feeding. Since then we have seen two others. We sure enjoy watching them. We used to have one that would come to our kitchen window and hover there to at us know we were out of sugar water for them.